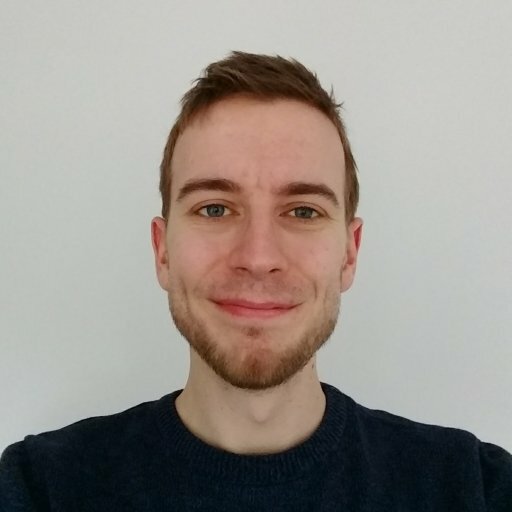 The bosses of Sekiro: Shadows Die Twice are usually content to beat you by more traditional means. That is to say, most of them will stab, kick, shoot or punch you to death. Twice. However, reach the Folding Screen Monkeys of Senpou Temple and you’ll be faced with a very different challenge. Instead of taking you on, these kimono-clad primates will run away, scampering across the Hall of Illusions. To take them down, you’re going to need smarts rather than strength. 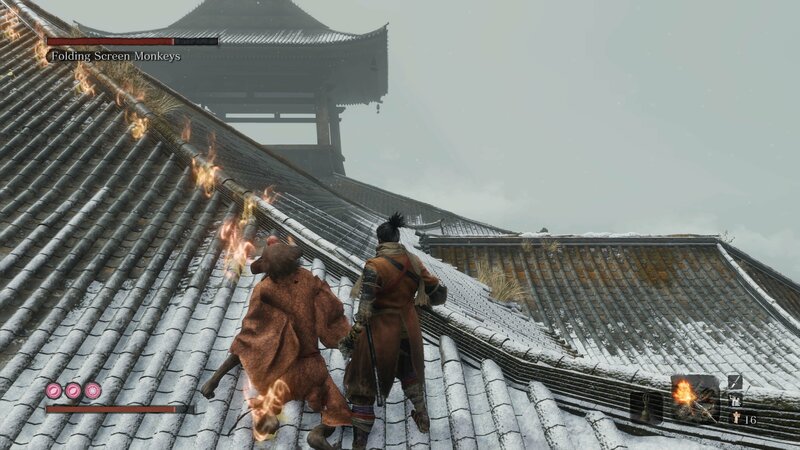 If you’re having difficulty catching these pesky chimps, this guide will teach you how to beat the Folding Screen Monkeys boss in Sekiro: Shadows Die Twice. Your task in this fight is to catch and kill each monkey, trapping them in the folding screen in the starting area of the arena. Each time you kill a monkey, the painting of him on the screen will change to show him hiding his face. Catch and kill them all and you’ll win the fight. 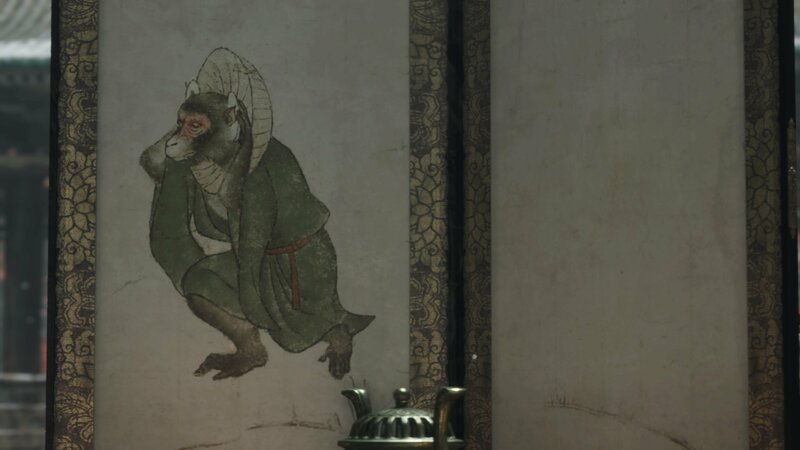 While it’s tempting to immediately give chase, the Folding Screen Monkeys is one of the few boss fights in Sekiro where you don’t need to move quickly. Instead, head forward on the wooden pathway and speak to the monk standing by the barrier ahead. He’ll teach you the secrets to three of the monkeys residing in this plane: the purple, orange and green kimono monkeys. There are actually four monkeys to find here, and each has its own quirk. We’ll take you through each of the Folding Screen Monkeys below so that you know how to catch them all. Before you begin, it’s worth noting is that after you catch the first monkey, sword-wielding spirit monkeys will begin to spawn and follow you throughout the Illusory Hall. The more monkeys you catch, the more spirits will chase you. They deal Terror damage, but killing them achieves nothing and they’ll respawn soon after, so you should mostly run and avoid them rather than fighting, though you can take them down for a brief bit of respite if needed. In addition, if you ever find yourself stuck, ringing the Illusive Hall Bell will return you to the entrance, and reset the positions of all the remaining monkeys. Starting Position: On the roof above the monk. Description: "The monkey in the orange kimono is the "Speaking Monkey". While he does not have particularly good eyesight or hearing. He makes a big fuss when he sees a threat, causing all the other monkeys to run. Or perhaps he merely enjoys toying with humans." Guide: The Orange Kimono Monkey is one of the easiest to kill thanks to his poor eyesight and hearing. From the start position (ring the Illusive Hall Bell to return here) he will be on the building in front, facing towards you. Immediately hide behind the folding screen on either side until he loses track of you, then grapple up to the roof for an easy kill. Gachiin’s Sugar can make you even harder for him to spot. If you fail to kill him at the start, The orange monkey will run only a short distance away across the roofs before stopping. 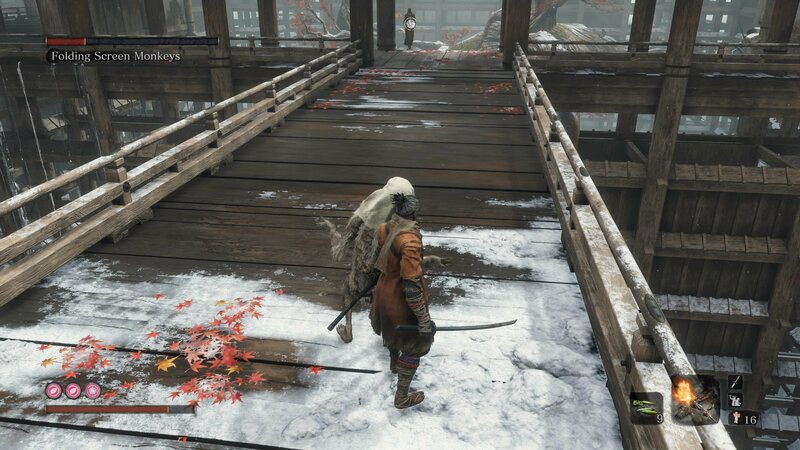 Keep track of his movements, then sneak to behind his position by hiding behind rooftops. So long as you keep track of his position, he shouldn’t be hard to kill. Reset with the bell if you lose him. Starting Position: On the second roof to the left. Description: "The monkey in the purple kimono is the "Seeing Monkey". He has excellent eyesight, can see great distances, and is very attentive. If he spots you, he will run immediately. He is exceedingly timid." Guide: This monkey’s eyesight is far too good to sneak up on him, but there are two locations in the dark where he can be caught. From the starting position, make your way forwards then take the path left into the roaring room with the water. Take the right exit and head into the next building. In here, turn left to enter the room with four candle-lit statues. Read the message on the wall then open the door at the back to blow out all the candles and cast the room into darkness. If the purple kimono monkey is chased in here, he will stumble around in the dark, unable to see, letting you easily kill him. Alternatively, the furthest building from the starting point of the arena contains an area inside, up in the rafters which is in total darkness. Monkeys chased alone the left path to this building will hop up into this spot. 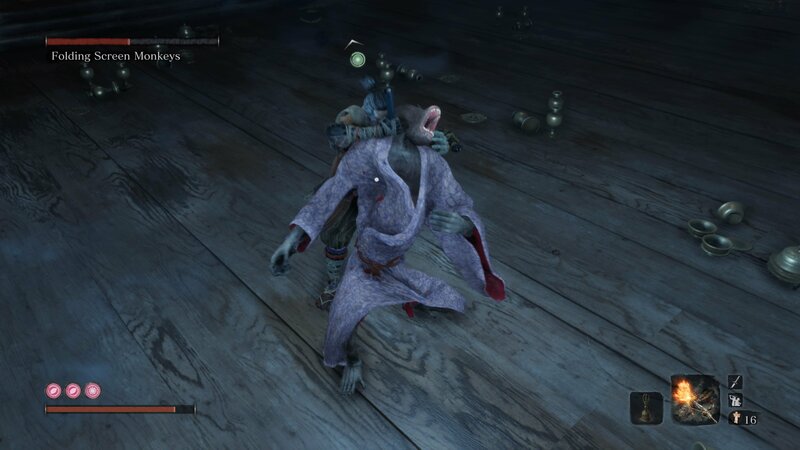 Follow the purple kimono monkey here and again he’ll stagger around in the dark, letting you easily backstab him. We recommend taking out the orange kimono monkey first to avoid him alerting the purple kimono monkey. Starting Position: On the tree in the center of the Hall of Illusions. Description: "The monkey in the green kimono is the "Hearing Monkey". He has excellent hearing, can hear across great distances, and is very attentive. He will generally run away the moment he hears you coming, making it hard to approach. He is exceedingly timid." Guide: There are a few ways to deal with the green kimono monkey. If the other monkeys have been dealt with already, it’s actually possible to spring and grapple to the centre tree before he moves. Here you can use shinobi firecrackers to stun him. For a more standard path, follow the path to the left from the starting point, then turn right out of the room with the pouring water. Follow this path forward through the next building, then turn right into the hallway. Interact with the large bell here to ring it. The loud noise will stun the green kimono monkey, giving you time to sprint and grapple to the center tree and kill him. This will work best with the orange kimono monkey dead so that he can’t scare the green kimono monkey away from the center tree. Use the Illusive Hall Bell to reset their positions. Alternatively, chase the green kimono monkey into the first building on the left from the starting point. This is a large room with flowing water in it. The message on the wall will let you know it is deafening, so if you chase the monkey into here, he won’t be able to hear you coming any more. Sneak up on him for a backstab. Starting Position: Directly behind the player at the beginning. Typically the final monkey that players will kill, the invisible monkey is represented by the blank part of the folding screen. This monkey follows the player, leaving glowing footprints and spawning ghost monkeys that inflict terror. Once you know he’s there, killing the invisible monkey is pretty easy, simply swipe at the end of the footprint trail. If you’re having trouble finding him, the easiest way to kill him is to ring the Illusive Hall Bell, then immediately turn round and slash behind you. If you fail to hit him, ring the bell and try again. Once you’re aware of his existence, the invisible monkey is the best and easiest monkey to kill first, as this will stop the spirit monkeys from spawning. This makes the fastest order to deal with the monkeys: Invisible > Orange > Purple > Green, ringing the bell between each one to reset them. 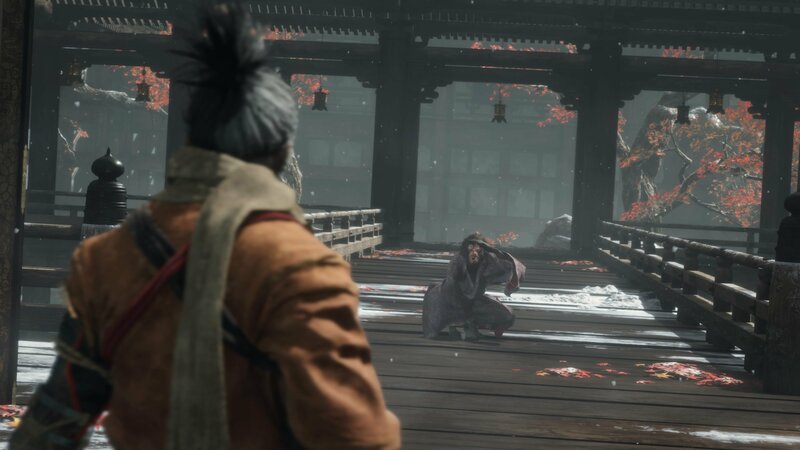 You now know the secrets of how to beat the Folding Screen Monkeys boss in Sekiro: Shadows Die Twice, and are free to claim the Mortal Blade. You’ll also gain the Ninjutsu Puppeteer Technique, which can help you get past the Giant Snake. There are still many challenges ahead, however. If you haven’t been to the Sunken Valley yet, prepare yourself to face the powerful Guardian Ape.